“3X3” is an ongoing series of albums that are released by the Canadian label [walnut + locust]. The kind of music displayed on the different albums (there are not many of these in the series, four so far) vary a lot, and the constant parameter considering every release so far, is the number of participants, which is, you guessed correctly, three. The theme of each release is related, of course, to those participants, and on this album the orientation is more towards rhythm and electronic beats. If I am not mistaken, most of the albums by [walnut + locust] are not rhythmic at all, so it’s interesting to hear a rather new approach from this direction. 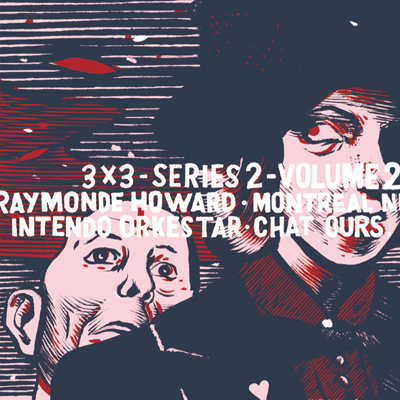 To be more precise, two of the three musical projects that are presented in this album have released albums or tracks through this label before, but while Raymond Howard had one similar (in style) track on a compilation album, Montreal Nintendo Orkestar’s albums, at least those I have heard, were more abstract than what we can hear on this collaboration. The three acts are sitting together on a 3″CDr that offers an enjoyable ride. Opening the album is Raymond Howard, with two frantic, energetic songs. This beginning, armed with real nice female vocals that adds a delicate, yet barbed voice to the music, starts the album with a powerful kick. Raymond Howard leans more towards alternative electronic music and serves as a joyous, playful opening with its catchy whistling and great singing. Following the first act is the Montreal Nintendo Orkestar. Their first track is much more atmospheric and warm, and comes as a contrast to the two earlier tracks. The next track by them is a much more epic moment on this album, reminding of early digital industrial music and utilizing simple digital sounds to create a really dramatic music. Closing the album are the members of Chat Ours with two tracks that have gone to the realms of electro music, blending sweet music with a little more melancholic notion. Chat Our’s music is rich and layered and offers as much energy as Raymond Howard had shown before. The editing of this album is really successful in the sense that, if played repeatedly, it creates a perfect musical circle. Each track leads perfectly to the next one, and the last track by Chat Ours is a great introduction to the first Raymond Howard track as well. [walnut + locust] displays a sense of adventure by releasing this fun album, and this adventure leads the label and the artists themselves to a great result, even if a little short.